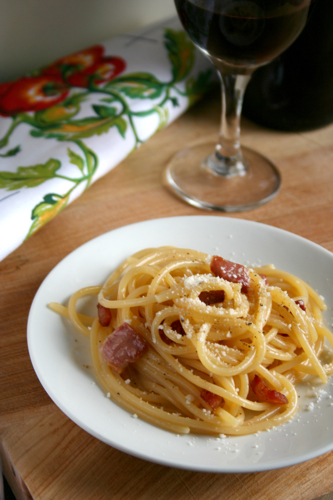 Spaghetti alla carbonara is quite simply Italian comfort food. All-American eggs n' bacon are added, creating a magical mix of creamy and crispy that makes you savor every strand. Set a pot of water to boil. 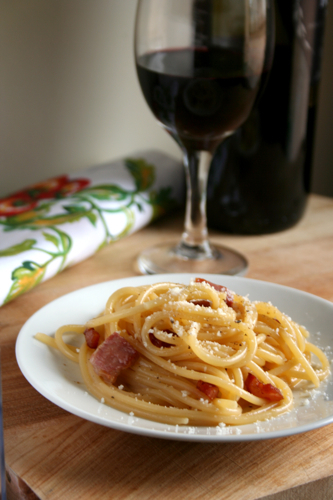 In the meantime, in a sautè pan over medium high heat, cook the pancetta until nicely browned, about 7-10 minutes. Remove from pan and let drain on some paper towels. Beat the eggs with the salt and pepper. Cook the spaghetti in the pot and drain when al dente. Pour back into the pot with the eggs and pancetta, mixing well until all is combined and the eggs are slightly cooked. If it looks runny still, you can turn the heat on to medium while you stir for another minute or so. Add the cheese and serve immediately. Because we could all use a little comfort food every now and then.